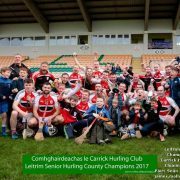 Our congratulations are extended to the hurlers of Carrick Hurling Club who captured the Connacht Junior Hurling Championship following a 2-11 to 2-9 victory over Galway Junior Hurling Champs Ballygar. Having qualified for the final last Monday with a victory over Sligo Champions Coolera/Strandhill, they were determined not to let this chance of provincial glory slip from their grasp. Ahead at the break 0-6 to 0-5, they stormed their way to victory in the second period and withstood all the Ballygar lads could throw at them. Captain James Glancy accepted the cup on behalf of his delighted teammates while Clement Cunniffe was Man of the Match with a return of 1-6. Next up for the Carrick boys is a meeting with the Ulster champions, still to be declared, in January 2019. Interestingly, this is the first time ever that a male team from Leitrim has won a provincial club title after defeats in 13 finals across all grades and codes. Savour the moment!! 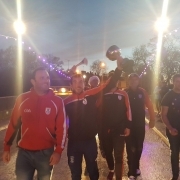 Carrick Hurlers crossing the bridge into Leitrim at Carrick-on-Shannon earlier this evening. You are asked to note that Nicky Rackard Cup Leitrim v Tyrone will now throw in at 2pm in Páirc Seán Mac Diarmada tomorrow, Saturday. Today, 9th February 2018, Leitrim Hurling was left shaken and in disbelief by the news of the death of Leitrim Hurling legend, Patrick (Paddy) Phelan. One of the great players, managers, committee members, and characters the GAA has ever seen, Paddy will forever be a legend, especially within the Leitrim hurling family. It is hard to know where to begin when it comes to this legend and good friend of mine Paddy Phelan. Paddy was a stalwart, a hero and an inspiration. He encompassed everything that was right about the GAA. Paddy was widely regarded as a people person, always willing to give of his time. There are no words we can say here to do justice to the person that Paddy was. He will be so much missed. He was a real friend and a gentleman. If you’re looking for a real role model, then you look no further than Paddy Phelan. While Paddy was born and reared in Kilkenny, Leitrim took a huge part of his heart when he moved to the county to work as an engineer in Leitrim County Council. Approximately 40 years ago, Paddy, Michael Dorrigan and I met and struck up a strong friendship based primarily around hurling which resulted in the three of us commencing hurling within the county. However, it must be said that without Paddy it would never have been the success it was. The three of us soldiered together and never was a bad word said between any of us. Unfortunately today the link has been broken with the loss of Paddy. Ironically, the last time Paddy saw his beloved Leitrim Senior Hurling team tog out in the green and gold was in Croke Park, the hallowed ground in June 2017 when the team reached the Lory Meagher Championship final. This occasion was the first ever time for a Leitrim Senior hurling team to reach Croke Park and what an occasion it was! How proud Paddy was that day watching lads he had coached from a very young age run out onto Croke Park to play in an All Ireland Final. All those days in Park Lane and travelling the county for matches with the bag of helmets, hurls and sliotars had finally come to fruition. I, for one, am delighted Paddy was there with me that day to experience such a marvellous occasion and to offer his constant positive support and guidance not only to me as manager but to every single player on the team. It is impossible to put into words what Paddy means to hurling in Leitrim and the void that has been left by his passing. We can, however, be grateful that his son, Hilary, has taken over from Paddy as Secretary of the Leitrim Hurling Board, while his grandson Liam is on the verge of breaking onto the Leitrim Senior Hurling team, which I know very well Paddy is very very proud of. Paddy’s involvement in Leitrim GAA and Leitrim hurling, in particular, has been profound. Paddy has been involved on Connacht Council, representing Leitrim hurling, and has also been a member of the Leitrim GAA Executive for a long period of time. Most notably, Paddy has served as Chairperson, Secretary & Treasurer on the Leitrim Hurling Board at different stages over the last 40 years. His work and commitment to all committees he has been involved in is an inspiration and his dedication has been second to none. The last Leitrim Senior hurling game which Paddy played in was just 25 years ago when Leitrim were short a player against Sligo in a National Hurling League game. Of course, Paddy stood forward and said he would fill the place which he did. He grabbed the green and gold jersey without a word said and played the match. Not many people can say they had such a long hurling career as a player. This showed the character of Paddy as he would never let you down. Similarly, just last year when Paddy was receiving treatment in Galway, he would make sure that he would be home on time to go to training with me in Mullingar. He enjoyed those training sessions and the matches with the boys and the fun that was had. Over his years involved in Leitrim and the time I have known Paddy, one thing I must say about him is that he never ever criticised a referee or a match official. At the end of a game and if luck wasn’t on our side Paddy always said: “Ye had your chances”. He was exactly spot on! The memories of Paddy we have are endless and I am sure these memories will continue to be shared for a long time. Paddy brought such joy and happiness to so many people and his presence will be greatly missed. I will greatly miss Paddy’s company going to training sessions and matches with the Leitrim hurling team along with his guidance and constant support. His passing is a huge blow to Leitrim Hurling while the passion he had for his home county and hurling, in general, is inspirational. As manager of the Leitrim Senior Hurling team, the biggest thing this team can do now is to go on and win a National Title in 2018 in Paddy’s honour. And we will for Paddy! On behalf of Leitrim Hurling, I wish to offer our deepest sympathies to his wife Monica, his sons Alan, Hilary and Patrick, daughters in law, grandchildren, relatives, neighbours and his wide circle of friends. Thank you for all the good times Paddy. We will never forget you. Rest in Peace. Compiled by Martin Cunniffe, Chairman Leitrim Hurling. Patrick Phelan B.E, C.ENG, formerly of Leitrim Co. Council. Patrick late of Station Rd. Carrick-on-Shannon and formerly of Ballinaslee, Attanagh Co. Kilkenny on February 9th, 2018. Deeply regretted and sadly missed by his wife Monica (nee Gleeson), loving sons Alan, Hilary, and Patrick, daughters in law Helen, Karina and Olivia, grandchildren, brothers Donal (Kilkenny) and John (Newbridge), relatives, neighbours and a large circle of friends. Reposing at the residence of his son Hilary and daughter in law Karina, opposite Drumsna Church, on Sunday, 11th February, 2018 between the hours of 2pm and 6pm. House strictly private at all other times, please. Funeral Mass on Monday, 12th February, at 2pm in St. Michael’s Church, Drumlion with burial immediately afterwards in Drumlion Cemetery. Family flowers only, please. Donations in lieu to North-West Hospice, Sligo. Our congratulations to the hurlers of Carrick Hurling Club who earlier this afternoon claimed the club’s 32nd County SHC title with a clear 3-11 to 0-8 victory over Cluainín Iomáint. Played in Páirc Seán Mac Diarmada, the Carrick lads were into their stride from early on and held a 1-5 to 0-5 halftime advantage. They quickly added to this advantage and two late goals by Liam and Colm Moreton cemented the title win over a luckless Cluainín team. Man of the match was Colm Moreton who scored 1-5 while his brother Liam added the other two goals. It was heartbreaking for the lads from Manorhamilton as they have been defeated in the SFC and SHC Finals in the space of seven days. Nonetheless, for the Carrick Hurlers, this title is a most fitting tribute to the late Bernard Murray, their staunchest member over many years who passed away suddenly last month. 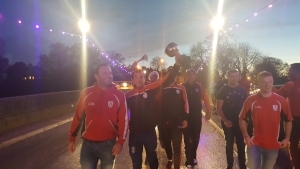 Led by Man of the Match Gavin O’Hagan, Cluainín outplayed Carrick for almost the entire game to retain their county crown at Carrick-on-Shannon. CluainínÓgot off to a great start with a Kevin ClerkinÓgoal just after the throw-in. Errors by Carrick ’keeper Alan Duffy saw further goals conceded to Karl McDermott at the end of the first half and to Clerkin again within three minutes of the restart. Carrick trailed by just two points at the interval (1-6 to 2-5) but only added four Clement Cunniffe second half points while Cluainín registered 1–9. Vinny McDermott hit a 19th minute Carrick goal while Cunniffe added four points, plus a point each from Brian Carroll and James Kane. scorers Cluainín: G. O’ Hagan 0-10 (nine frees), K. Clerkin (2-0), K. McDermott (1-1), N. McLoughlin (0-2), D. Poniard (0-1). scorers for Carrick: C. Cunniffe (0-8 (seven frees), V. McDermott (1-0), B. Carroll, J Kane (0-1 each). CLUAINÍN: V. Cronin; P. Clerkin, M. Poniard, P. Clancy; P. Loughlin; S. Feeney, S. McTiernan; D. Poniard, M. McKeon; M. Dolan, N. McLoughlin, J. Rooney; K. McDermott, G. O’Hagan, K. Clerkin. Subs: B. Feeney for Dolan (48); J. O’Brien for McTiernan (57); C. Beattie for K. Clerkin (60). CARRICK: A. Duffy: D. Butler, T. Glancy, S. Glancy; B. Murray, D. Byrne, C. Maguire; C. Cunniffe, G. McGovern; J. Kane, D. Hughes, C. Morton; D. Deegan, V. McDermott, B. Carroll. Subs: B. Kane for S. Glancy (37); L. Morton for Maguire (38); A. Doherty for Carroll (52); S. O’Toole for Byrne (53); C. O’Reilly for Deegan (54). Referee: J. Sexton ( Cork ). Dates, Times and Venues TBC. Ballinamore is hosting a three-day Hurling Summer Camp in Páirc Sheáin Uí Eislin in Ballinamore starting next Monday, 29 July, with County Coaching Officer Steve Feeney. Other coaches will be there also and it is open to all youngsters Under13 and younger to come along and learn the skills in a fun setting. Hurling is now acknowledged as the most exciting field sport of all and the excitement generated by this year’s Hurling Championship has been immense. Free Hurley and sliotar for all taking part and its only €30 for first child with concessions also. Parents can come along and encourage all. This is a wonderful opportunity for youngsters to learn hurling skills. Starts at 10.00am on Monday next. The finals of the Leitrim Hurling Poc Fada took place on Saturday in Carrick Golf Club. In an exciting new format which took place over six holes of the course the senior winner was Alan Duffy (Carrick Hurling Club) with 23 shots. Second was Gary Coone also Carrick Hurling. The other competitors in this category were James Glancy, Conal McGuire, Stephen Feeney, Gary McGovern and Ryan Lonican. In the Under 16 competition the winner was Damon Beattie (Cluainin) with clubmate Stephen Loughlin runner up. Also taking part in the Under 16 competition were Shane Beirne, Dessie Beirne and Hugh Glancy. The winner and runner up in each category now go through to the Connacht finals in Ballyhaunis. Some photographs are available here.